Spacious, luxury, 4 Bed Disney Villa With Pool, Garden, Games Room etc. Palm Trees is a beautiful, spacious (2,600 sq ft), quality, 4 bedroom/ 3 bathroom villa with private pool and garden. The villa is professionally furnished to a high and comfortable standard. Our local management team keep the villa spotlessly clean and are on hand if you need any thing. We frequently re-fubish the villa. Palm Trees is very spacious (larger than most 5 bedroom villas) and very well equipped for up to 10 people - you won't need to keep putting the dishwasher on because you've run out of mugs! The kitchen is fully equipped for a snack, or a full Christmas lunch and yes we do have an electric kettle and a tea pot for our many UK guests. Palm Trees is in the peaceful Four Corners community - a mixed community of residential and holiday homes. It is only 10-15 mins from Disney and 5 min from Champions Gate golf complex. There are plenty of shops and restaurants within a few minutes. The villa has a secure WiFi Internet system - just bring your laptop or smartphone etc. You can also make phone calls to the UK or USA free of charge from the villa phone. The villa has four bedrooms, all with TVs/DVD or blu ray players, a large king (6ft) an American queen (5ft), and two twin bed rooms - s Mickey room and a Disney Safari room. We are very happy to try to answer any questions you have so please just sent us an email or give us a call. all communication, rental procedures, and organization within the home. soap, garbage bags, dishwasher soap, and other cleaning supplies). The house was perfect and worked out great. I would just like to thank you for letting us stay in your gorgeous villa.We had a brilliant holiday and just like last time the villa played a huge part. Palm Trees is ideally situated just 15 min from Disney. It is also close to the Interstate 4 and so it is easy to get to either West or East cost of Florida for a day at the beach. We chose a villa with a garden (unusual for an Orlando villa), pool, and lots of space behind as we like our privacy and did not want to be on top of other villas. We also enjoy the peace and wildlife of a tropical garden. My hobby is gardening and I enjoy growing the tropical shrubs and palms that I could not grow in the UK. The villa is spacious - great when we have our children and grandchildren to stay ! Palm Trees has a large lawned garden behind the pool - a great place for kids to play. Four Corners is a quite development but only a few minutes drive from hypermarkets, theme parks, golf etc. 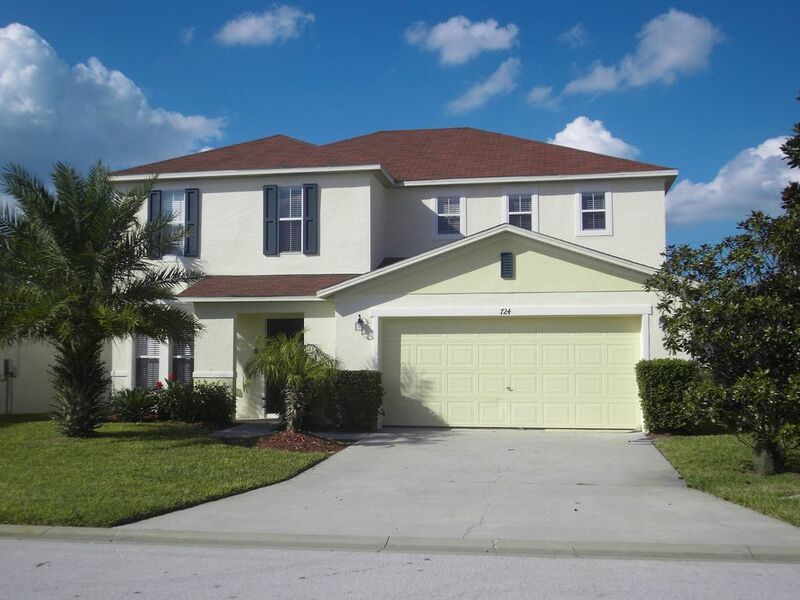 It is also only a few minutes from the Interstate 4 with quick access to the rest of Florida. The villa is very spacious and sunny with lots of extra comforts that other villas don't have, upgraded cable (sports package etc), marble bath room, TV in every bedroom, dedicated games room, luxury cushioned out door chairs and loungers, gas BBQ etc. We think of it as our home and so have added the comforts we like - good quality beds, comfortable sofas etc. We have a local management company, on hand 24/7 in an emergency, and they keep the villa and pool spotlessly clean. 3 bathrooms; Luxury en-suite to bedroom 1 with his and hers basins, marble top, bath and walk-in shower. Large family bathroom, bath with shower, toilet. Downstairs shower room with toilet. Towels for use in the house, and hair driers are provided. All the beds will me made up on your arrival and the final laundering is included in you rental. You can use the villa washing machine to launder sheets etc during your stay if you wish to. Plenty of white towels for use in the villa. All you need for a full family meal. Huge DVD/Bluray library for both adults and children. Palm Trees has a private garden with a shrub hedge - increasing your privacy. With optional heating - recommended Oct to May. Notes on accommodation: The villa is great for children. We provide a cot/ crib (travel) and high chair. There is also an inflatable bed for use by a child if you prefer to have a young child in your bedroom or put three children in either of the twin rooms. We also provide 'magic bed bumpers' for toddlers using a 'big bed'. The villa has full air-con in summer and heating in winter. Pool heating is an optional extra. We do all we can to make the villa feel like home. Outside: Palm Trees has a large private 27' pool - with optional heating and a cover to keep the water warm in winter. The decking area has cushioned loungers, tables and chairs for out-door eating. There is a gas BBQ. The pool has a removable child safety net and can be heated (optional extra). Beyond the pool area is a large garden planted with palms, shrub hedge (for your privercy), tropical flowers and a lawn. The large lawned area to the rear gives the pool an open sunny aspect. An ideal place to spend warm evenings, relaxing after a day at the parks or on the beach. Utility Room: Washing machine, dryer and iron if you feel the need to do the laundry while on holiday !. Cleaning / Towels / Linen / Maid service: Towels and linen for use in the villa are included. The villa is cleaned before your arrival but additional cleans, mid stay, can be arranged if required. Welcome food packs can also be booked. Other: Dedicated games room with darts, table football, air hockey and pool table, TV with DVD player and PS 2 with games. Spacious rooms. Very relaxing atmosphere. The games room and pool were an instant hit with the grandchildren. It was very easy getting around to visit Disney World and Universal Studios. The nearness of Highway 27, I4 and 192 provided lots of venues for shopping and for finding places to eat. Would certainly return ourselves and recommend it to others. Thank you for taking the time to give us your review of our villa. Thank you for taking the time to review our villa. Palm Trees is ideally situated for visiting the theme parks of Orlando. The villa is only a couple of min drive to the Interstate 4 with access to both the west and east coasts - both just over an hours drive and both with beautiful white sand beaches. Orlando int airport is about 35 min drive, Sanford about an hour, Tampa airport is about 80 min away. Miami is about 4hrs drive away. Four Corners is on the H27 a couple of minutes from the Intersate 4. 35 min from Orlando int. Ideally situated 5 mins away from the Interstate 4 and not much further to Highway 192 both with very speedy access to Disney, Universal Studios and the Water Parks. Disney World is 10-15 minutes away via the I-4. There are 2 hypermarkets within about 5 minutes of the estate and many restaurants and takeaways within easy reach. Palm Trees is an ideal base for exploring central and southern Florida with its location close to the I-4 and that Freeway’s direct connection to the Gulf and Atlantic coasts. Booking Notes: We only take bookings of 14 nights+ at Christmas and Easter. Pool heating is an optional extra at £80 per week. Changeover Day: Flexible. Notes on prices: Pool heating is an optional extra at £80 per week in winter and £60 a week in summer. A cleaning charge of £60 is added to stays of less that 7 nights.